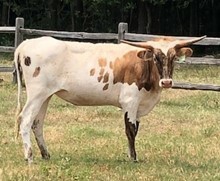 Wiregrass Joyce is a beautiful example of a longhorn cow. She is solid in size, straight-backed, neat underneath, rich in color with twisty horns that are a lovely shape and good length. She takes cubes by hand.